Well, there’s an example. In 1959 people didn’t yet know that it was a good time to be a white male. They didn’t talk that way. It is a small sloppiness, but a sloppiness all the same. And as the film goes on the sloppiness becomes more and more obvious. 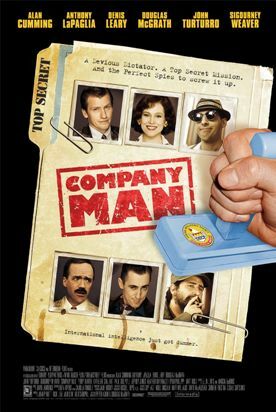 Alan pretends to be a CIA agent, the grammar teaching job only a cover, in order to keep the family happy, but through the accident of helping a Russian ballet dancer (Ryan Phillipe) to escape, he is asked by the CIA to become an agent for real, and is sent off to what seems at the time to be the quiet backwater of Cuba under the dictatorship of Batista (Alan Cuming). As the film’s running joke, Quimp keeps correcting everybody’s grammar and so stumbling onto more and more vital information for the CIA, personified on the island by Agents Fry (Dennis Leary) and Johnson (John Turturro) and Chief Lowther (Woody Allen). The latter is supposed to have been exiled to Cuba by the agency for leaving his code book in a Soviet-owned brothel and so getting 48 agents hanged. Funny, huh? This sounds to me like a Woody Allen joke, as do many of the other jokes. One supposes he was encouraged to ad lib. But both he and the gung-ho anti-communist played by Turturro are way over the top. So are Batista and Castro (Anthony LaPaglia) and Daisy, whose domineering personality and ambition to turn her husband’s adventures into a best-selling novel—Mrs Spy, That's I—are both deeply unfunny.